Cakrawala Pendidikan is a high quality open access peer reviewed research journal that is published by Institute of Educational Development and Quality Assurance of Yogyakarta State University (LPPMP - UNY). 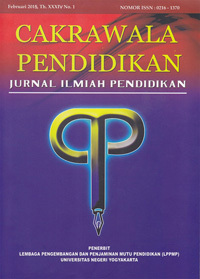 Cakrawala Pendidikan is providing a platform that welcomes and acknowledges high quality empirical original research papers about education written by researchers, academicians, professional, and practitioners from all over the world. Cakrawala Pendidikan with ISSN 0216-1370 (printed) and ISSN 2442-8620 (online) has been re-accredited by Indonesian Ministry of Education and Culture decision Number 51/E/KPT/2017 which is valid for five years since enacted on 4 December 2017. CAN STUDENT ASSESSMENT SHEETS REPLACE OBSERVATION SHEETS? DOES SLEEP QUALITY SERVE AS A MEDIATOR BETWEEN WELL-BEING AND ACADEMIC ACHIEVEMENT? PRANATACARA LEARNING: MODELING, MIND MAPPING, E-LEARNING, OR HYBRID LEARNING?